Generate online leads and digital sales with our integrated services. We custom build to deliver results and sales. Digital Sales require a Web/Mobile Developer with at least 2-3 years industry experience to join our studio team. 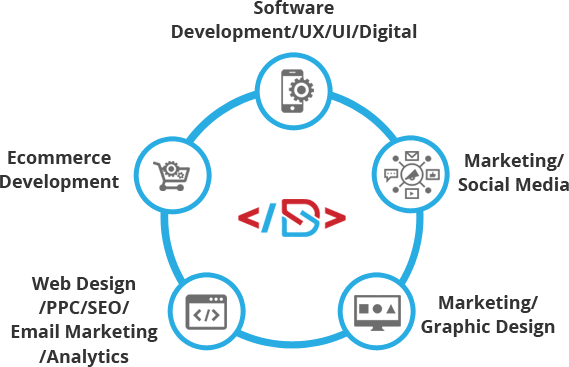 We are a User Experience Design and Innovation agency and work with a range of digital applications, systems and software. We follow a highly collaborative, user-centred design process and require all our staff to share our passion for the experience of the end-user. The Developer must support our UX, UI and Front End Designers with an agile and fast-paced approach to all projects. The successful candidate will be confident communicating and solving complex problems relating to mobile development. Meticulous project management skills and focus on deliverables for internal and client projects are essential. Include a cover letter detailing your most challenging and rewarding development project to date and a brief description of why you feel you are a good fit for the Digital Sales team. For this role, you will be responsible for the day-to-day management of various digital projects. We expect you to be a tech-savvy with an in-depth understanding of digital technologies. You should be very organised with good attention to detail and have excellent time management skills. As a Digital Project Manager, you should also have good communication skills to collaborate effectively with internal teams and customers alike. Ultimately, you should be able to manage and deliver projects within quality, time and budget requirements. The PPC/Paid Search Analyst is responsible for administering and helping to manage Pay Per Click media strategies for clients. The PPC Analyst can quickly understand and support initiatives that will contribute to the goals and success of client campaigns. Experience working with popular PPC ad platforms (AdWords, Bing, Yahoo).